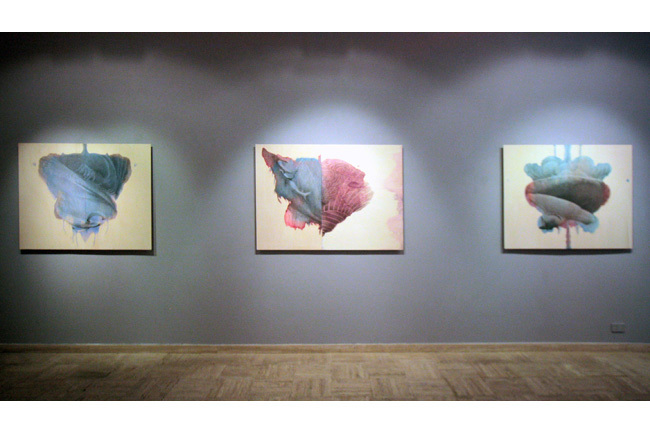 MAC Maja Arte Contemporanea is pleased to present Georgina Spengler's most recent cycle of paintings. 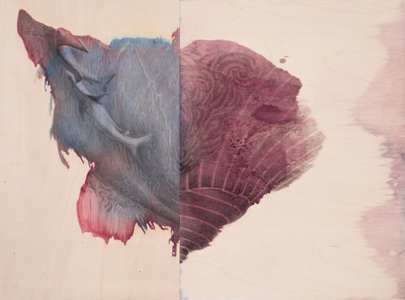 The ten works shown, all diptychs, (oil and charcoal on wood) start off from a color stain, which is then pressed onto another wood panel thus creating the diptych. 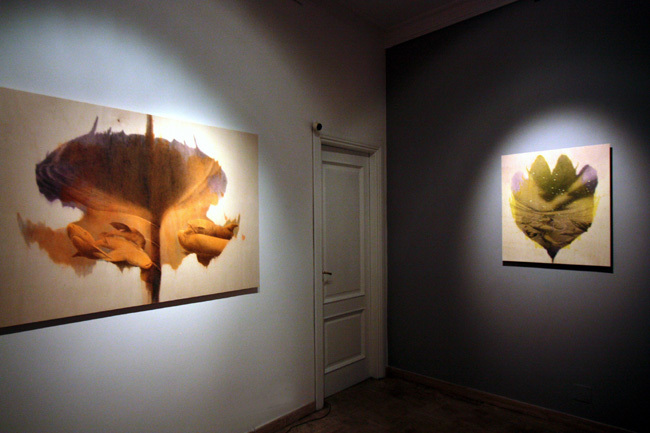 Claudio Zambianchi, who wrote the critical text for the exhibition notes: "The color, liquid and fluid, soaks into the wood and reveals the grain, similar to what occurred in Max Ernst's Histoire naturelle, but with a different technique (there we were dealing with frottage). The stain allows the hidden design of the wood to emerge, its complex skin which would otherwise remain mostly submerged. The double mirror image, as in a Rorschach stain, adds an ulterior element of stimulus both visual and imaginative to the mind of the artist. The preparatory process serves to free the imagination, which can now project onto the stain a world which is both aerial and abyssal, made of sky and deep waters, of Ouranòs and of Thàlassa; and if the celestial part is filled with fantastically shaped clouds, in the aquatic part of the paintings appear gorgons and creatures from the deep, creatures that are more related to mythology than to zoology." Georgina Spengler was born in Athens, Greece in 1959, where she spent her early childhood. Her family first moved to the United States when she was eight and then to Holland, when she was a teenager. There, amidst Rembrandt, Ruisdael, and Vermeer began her interest in painting and she frequented the Frije Academie of The Hague, taking figure drawing and painting classes. After finishing school, and with a very romantic vision of painting and art, she set off for Paris where she spent one year and attended the course of César at the Ecole des Beaux Arts. Seeking a more structured approach to painting she then went to study at the Boston University School of Fine Arts. She eventually completed her academic studies at the Corcoran Gallery and School of Art in Washington D.C.
She has shown continuously over the past 30 years in various group and solo shows, often collaborating with other artists. 2017 - Solo exhibition based on the poetry of Giorgios Seferis "Cisterns and Wells" at Samara Gallery Houston. With Serafino Amato "rare fare" at Hyunnart Studio, Rome. 2016 - With the photographs of Serafino Amato and the poet Beatrice Talamo, a collaborative project "La Magnifica Risonanza" at Casa Jellici in Tessero, val di Fiemme. 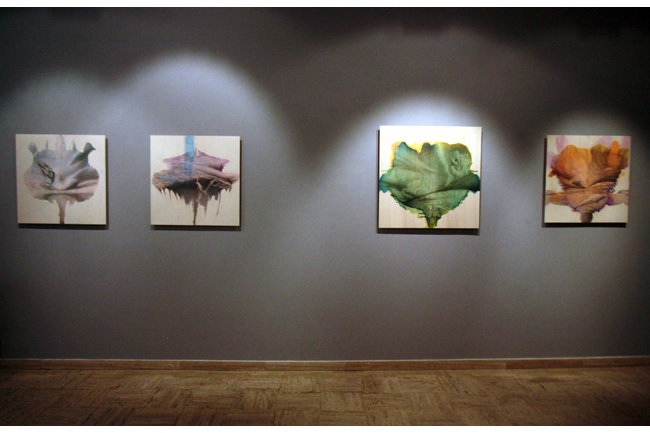 Group show "Fragili Eroi", Museo Bilotti, Rome. 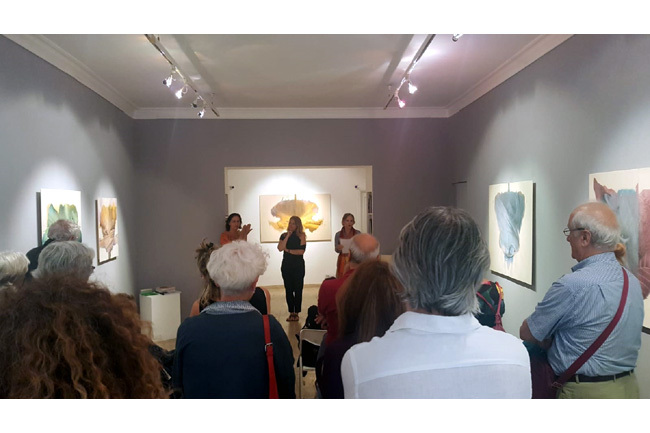 2015 - MAC Maja Arte Contemporanea, Rome, solo exhibition "Buone Notizie". 2014 - In collaboration with Myriam Laplante "In the end it will all be alright. Ha! 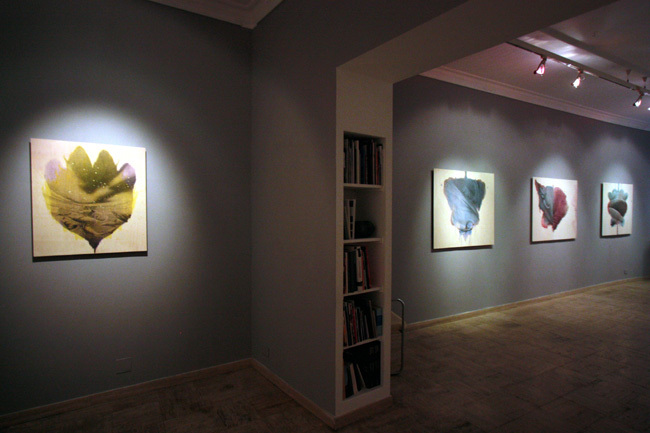 ", within the series of shows "Side by Side" at monti&co, Rome. 2012 - Founded together with a group of artists, 'Casa con Vista'; a circuit of 15 private houses in Rome, each hosting one artist who then created a specific installation for the house. The of the houses, all within walking distance of each other, was then open to the public. 2010 - She collaborated with a group of four poets and another painter, Edith Urban, on the project 'The silent space between the words'. The writers and painters set themselves in a continuum; the images and the words influencing and feeding each other. The final show was held at the Temple University Gallery in Rome and a second edition was held in Leipzig at the Spinnerei, hosted in the space of Colonia 210 in 2012. 2008 - Spengler's paintings have often dealt with poetry, she made a series of paintings dealing with the imagery of John Keats' final voyage towards Rome in 1820. It was exhibited in the Keats and Shelly Museum in Rome. Wanting to assimilate the complexity of Italian culture she moved to Rome in 1982. But as of yet not having completely fathomed it, she has remained, and still lives and works in Rome today.